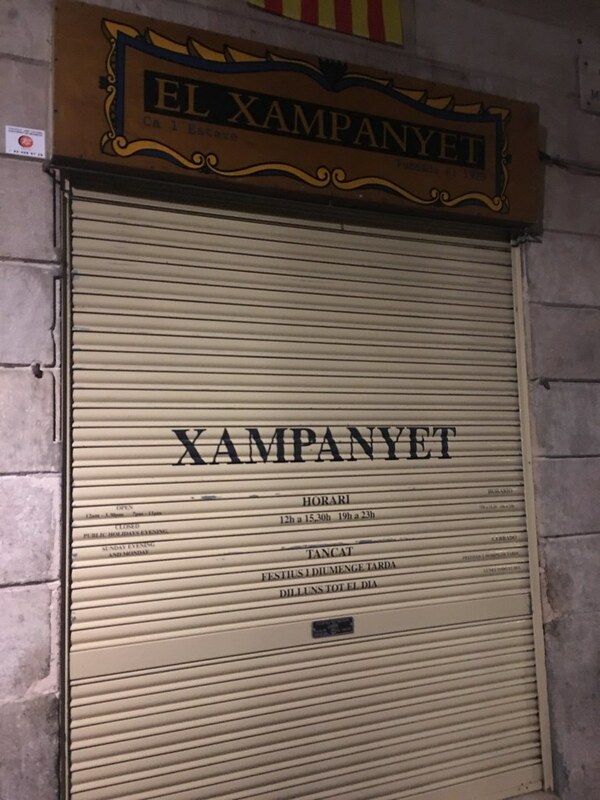 2 days ago after arriving into Barcelona, I ranted how sad I was to have discovered that what I thought was one of my favorite restaurants, La Xampanyeria, was closed the night before the Catalan Independence Day. It had been my favorite because we all had a special night there 5 years ago where one of our monsooners finally fell in love with all of food after eating here (while the rest of us fell in love with Iberian Ham). But that restaurant that I actually was thinking of was the similarly named (and equally popular) El Xampanyet, which was only a few blocks away from La Xampanyeria. 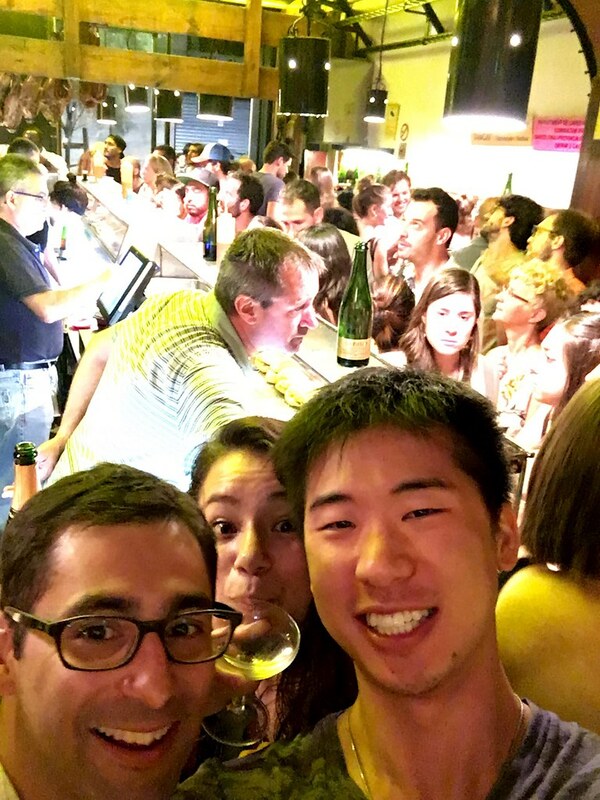 Even Gabriela and Ramón, my two local friends who live in Barcelona, had assumed I actually meant La Xampanyet when we all met up 2 nights ago but since I was so stupidly insistent, we almost went to a closed La Xampanyeria instead. So when I tried to go back to La Xampanyeria tonight to dine at what I thought would be a reunion at long last, I started to get vibes that it was not the same place. The first clue? The restaurant we went to 5 years ago had seats, and this one did not. 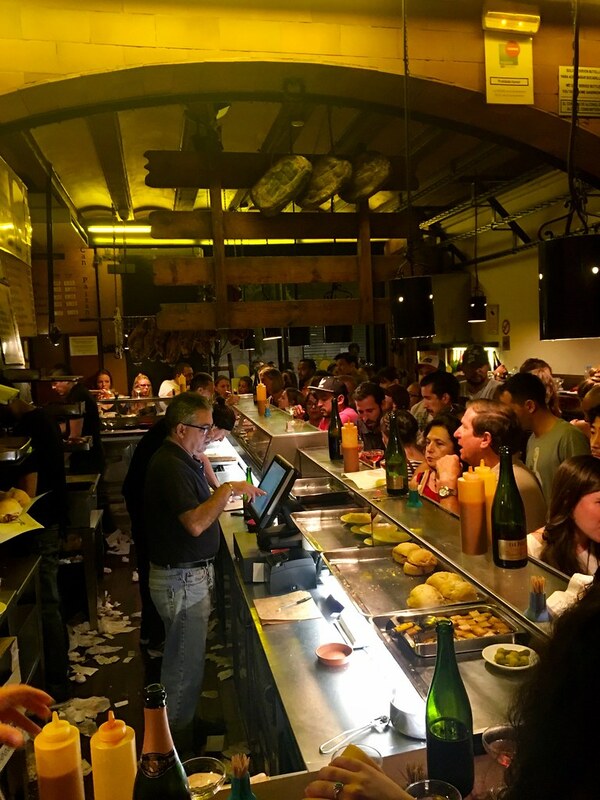 Although equally popular and equally packed, it’s standing room only, and it’s known for serving crazy amounts of free-flowing champagne with great food coming second. And yet, we still enjoyed our time here. Was it actually open 2 nights ago and could we have dined there? I don’t want to know. Instead, I’m going to believe that like La Xampanyeria, El Xampanyet was also closed on Saturday night in observance Catalan Independence Day and there was no way whatsoever I could’ve eaten at El Xampanyet on this trip. Ok? As I licked my wounds, we instead ate at neighboring Bodega La Puntual, which is run by the same people who own El Xampanyet. I guess I’ll settle for second place. And who knew how prophetic my words would be at the time, because we would then keep running into her again and again over the course of our weekend: once more at the hostel, twice at Barcelona Sants Station while heading to Andorra, and twice more back at the hostel after returning from Andorra. WTF, mate? Since these were obvious signs of a travel angel out there pushing us to get to know one another, we then exchanged few e-mails back and forth about meeting later for drinks. 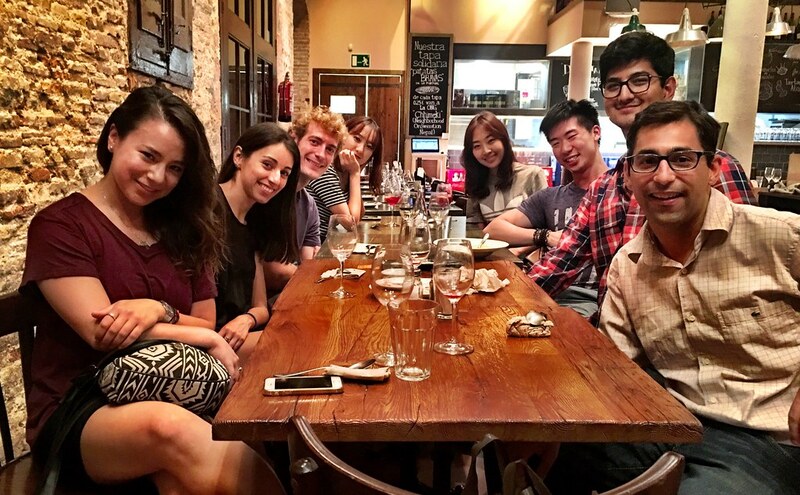 Although Hyungjung at first turned us down (she had an early flight back to South Korean the next morning), she eventually relented and brought another fellow South Korean whom she also just met at the hostel. And of all the jobs out there, this friend is also an ER nurse! 1) To preface, Christina, Venkat, and David, and myself are the 4 monsooners who all went to Andorra — this is their first time all meeting one another and among their striking shared interests and similarities — 3 of us graduated from Columbia University, 2 attended Ohio State University, 2 served on Columbia College Student Council, and 3 served on EC/MAASU boards — Christina, Venkat and David all hail from mixed ethnicities as well: Christina and Venkat are both half-Korean, Venkat and David are both half-Indian, and David and Christina are both half-Central European. 3) Nevertheless, Christina is fluent in Korean and was able to fully integrate Hyungjung and her friend in our conversations. Connection made. 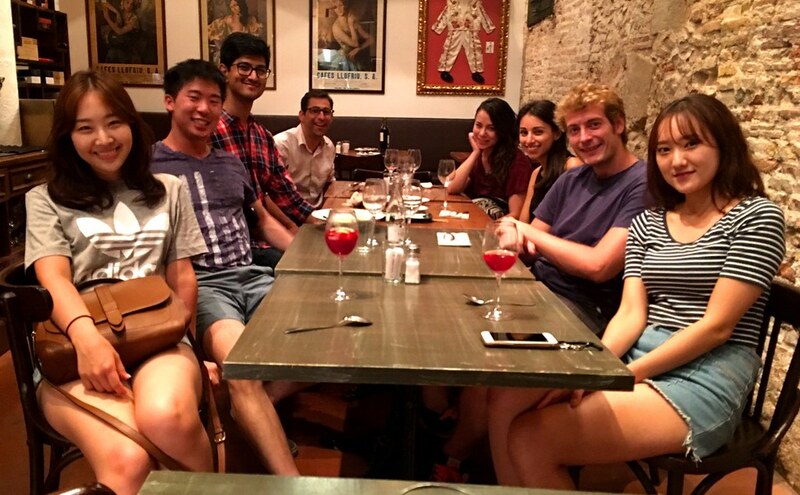 Venkat now has more friends to hang out with (hopefully) when he’s in Seoul. 4) And given all these random but seemingly fateful connections, the 6 of us — from all around the world speaking 2 completely different languages — were able to spend the next 4 hours bantering like old friends over drinks and shisha at cozy Ziryab Shisha & Cocktail Lounge, all the while knowing in the back of our minds, we would never get together like this ever again. 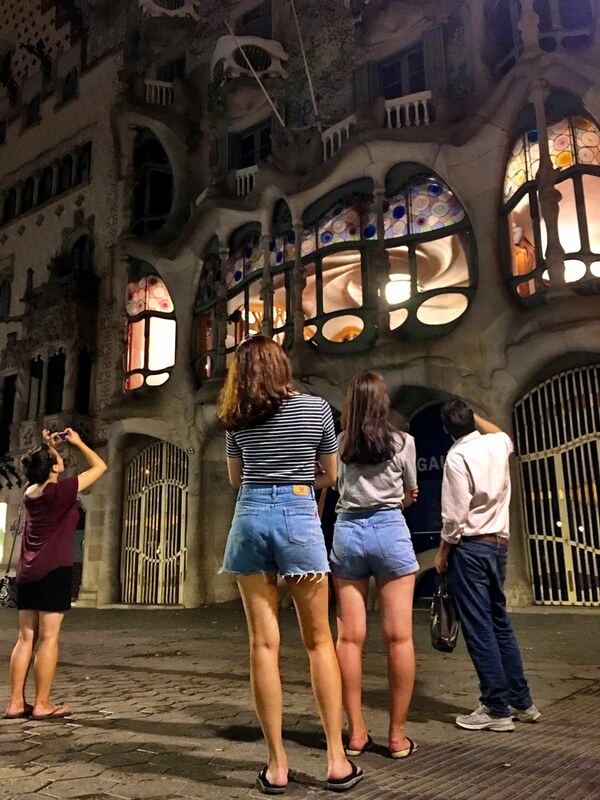 After things began to close at 2am, we ignored the calls of a convenient taxi ride and decided instead to take a leisurely stroll back to our hostel through the many beautiful neighborhoods of Barcelona. And with that, we close the next chapter to another memorable travel weekend.